Print your logo onto these custom printed compressed beach towel or one of our other innovative compressed towels & t-shirts and use them in your next marketing campaign as a unique giveaway item. Custom printed promotional beach towel compressed to your choice of shape (or even to your custom shape- at extra cost) These compressed beach towels are printed with a soft finish pigment dye that leaves the velour towel nice and soft. We can print up to full colour process or pms colours on the towel for you. (costs might vary depending on the exact artwork) Compressed Beach towels are an ideal gift with purchase, as you can shape them to symbolize your product and print them allover to have a long-lasting beach presence. The compressed towel is space saving and ideal for travel promotions or gift with purchase promotions where space is also of essence. Custom brand these compressed towels (size 28 x 28cm) or one of our best-selling promotional towels»compressed towels & t-shirts with your company logo! 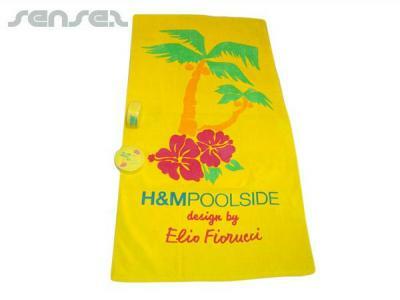 Your promotional compressed beach towel can be silk screen printed in 1 or more colours. Costs shown include a 1 colour logo print on your custom branded compressed beach towel. We can print more than 1 colour, however it incurs extra costs. We can achieve a perfect PMS colour match for the print. Personalise your compressed beach towel or custom design compressed towels & t-shirts for your marketing campaign. How can these unique promotional compressed beach towel or our personalised compressed towels & t-shirts fit in with your marketing strategy and help you maximise your brand exposure? Our custom made Compressed Beach Towel can be produced from a minimum quantity of 500 pieces. We can have your logo branded on these corporate Compressed Beach Towel in 1 Colour Silkscreen Print or Full Colour Digital Print. A setup fee of AU$380.00 will apply to make the film. The delivery time is 6 - 8 weeks from time of your order.